Choose to file online by clicking the ONLINE link and proceed to file electronically which is payable by credit card or ACH. If the filing type is not available online or if you prefer to mail or deliver your filing, click “PDF” to print a copy, complete the form, attach payment and mail or deliver to the Business and Commercial Services office. Subscribers who utilize monthly billing may view their transaction history here. Note: 26-54-105. Franchise tax reports. (d)(1) Every corporation that dissolves shall be required to pay at the time of dissolution the franchise tax for the prior calendar year and pay at the time of dissolution the minimum franchise tax for the year in which dissolved or withdrawn. Act 569 of 2007 requires nonprofit corporations to file an annual report with the Secretary of State’s office by August 1st of each year. 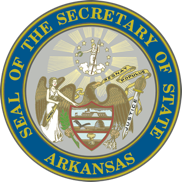 Copyright © 2017 Arkansas Secretary of State. All Rights Reserved.